As you can see, there are different types of wood pellet making machines on the market recently, such as flat die pellet mills, which can be divided as rotary die type pellet mills and rotary rollers type pellet mills, and ring die pellet mills, which can be divided as vertical wood pellet making machine and horizontal wood pellet making machine. Flat die pellet making machine, aka small pellet machine, comes out at the beginnings of the 20th century. At first, small pellet making machines are used to make animal feed pellets, but with the production capacity limits, small pellet making machines cannot meet the requirements of large-scale feed pellet production. Therefore, in the 1950s, the design of ring die pellet making machines came out. In that way, pellet production industry stepped into large quantity generation, and industrial pellet plants start to make more profits. In the 1970s, some feed pellet producers started to wonder that whether loose wood materials can be compressed into high density wood pellets for fuel. Right after that, wood pellet making machines came into being. 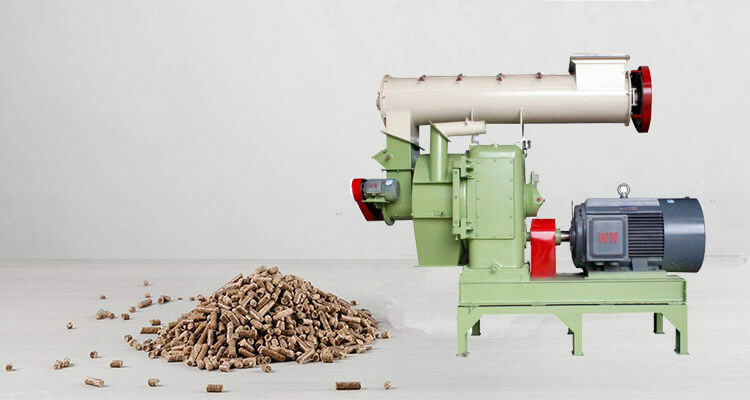 Wood pellet making machine adopts feed pellet mill technology, but with some partial adjustments. 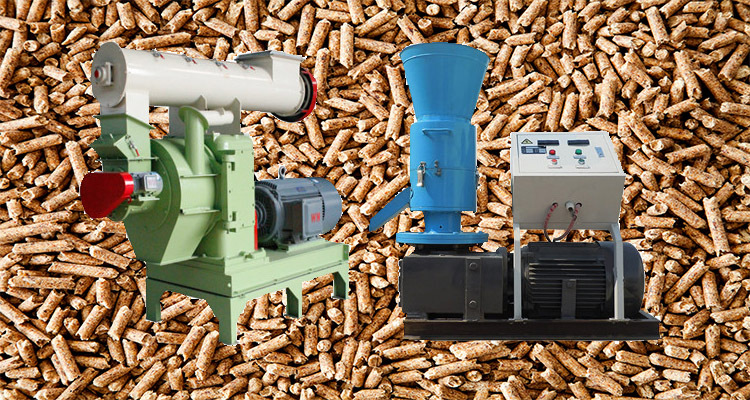 What Makes Wood Pellet Making Machine Useful? Wood pellet is a type of solid renewable fuel which is compressed by all types of wood materials, such as pine wood, fir wood, birch wood, aspen wood, and crop wastes, etc. Wood pellets are widely used as the fuel for industrial boilers, fuel for thermal power plants, fuel for BBQ, fuel for home heating systems, etc. The combustion efficiency of wood pellets is over 80%. The high combustion efficiency and low carbon emission make wood pellet a popular fuel around the world. Despite the low carbon emission, during the combustion of wood pellets, it creates little sulfur dioxide, ammonia nitrogen compound and dust. Wood pellets can be used as living fuel in everyone’s daily life. First, you can use wood pellets as the fuel for your BBQ grill, it is much easier to burn than charcoal. Also, you can use wood pellets as the heating fuel for your home, and there are many different types of pellet stoves has been brought to the market. Wood pellet is a clean fuel that has high combustion efficiency, and very easy to store. Nowadays, more and more families start to use wood pellets. 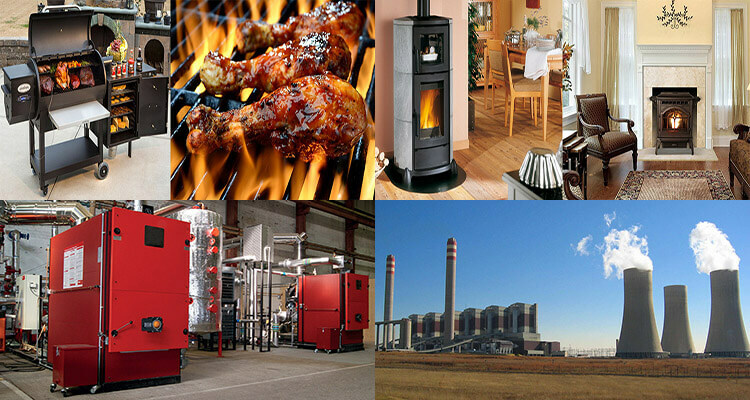 Wood pellets can also be used as the fuel for industrial boilers. Before wood pellets stepped into the market, the majority of industrial boilers use coal or heavy oil as the burning fuel. A few industrial boilers use natural gas, but the cost of natural gas is much more expensive than coal and heavy oils, so it can not be widely accepted by the industrial boiler owners. As we all know, coal and heavy oil have pollution problems. But wood pellets have little carbon emission that can reduce environmental pollution. Wood pellets can be used as the fuel for thermal power plants. Thermal power plants normally burn coal to generate electricity. Thermal power plants are the main electricity generation way in modern society. Although, there are a few thermal power plants use natural gas, but coal is also the main fuel for thermal power plants, and the pollution problem is a serious concern of global governments. 10,000ton wood pellets can replace 8,000ton coal, and reduce 160ton sulfur dioxide emission, 80ton dust emission, and 14,400ton carbon dioxide emission. Why is Wood Pellet Production Necessary? People’s demand for wood pellet make wood pellet a popular solid renewable fuel, and also accelerate the development of wood pellet making machines. There are some reasons that make wood pellets production necessary. The cost of fossil fuel keeps escalating, such as coal, petroleum, and natural gas. The increased fossil fuel cost will make the production cost of each plant increase, too. The environment pollution problem is becoming more and more serious. During the combustion of coal, it will create many different pollutants, such as sulfur dioxide, nitrogen dioxide, carbon monoxide, carbon granules, and dust, etc. The raw materials of wood pellets are everywhere, and the cost of woody raw materials is low. There are many different types of raw materials that can make wood pellets, such as wood chips, wood shavings, sawdust, wood branches, cotton stalks, rice husk, grass, etc. All these materials are wastes from wood plants and farms, that you can easily get hands on them with very cheap price. All these reasons make people eager to find a new type of renewable fuel. But why wood pellets? Why not burning wood directly? Here are some main reasons that make wood pellet production necessary. Wood sources are scarce, and log grade wood has a wider application range. It can be used to make quality furniture, handicraft, musical instruments, paper, etc. Moreover, the growth of trees is slow, and log grade wood has high moisture content, which needs a long natural air drying process. In some suburban areas in developing countries, many people may use other woody materials as the living fuel, such as cotton stalks. But different wood materials have different sizes, density and moisture content, which makes the combustion performance unstable, and some large materials can not be put into the furnace. Wood pellets are the fuel with uniformed size, high density and low moisture content that are easy to burn. 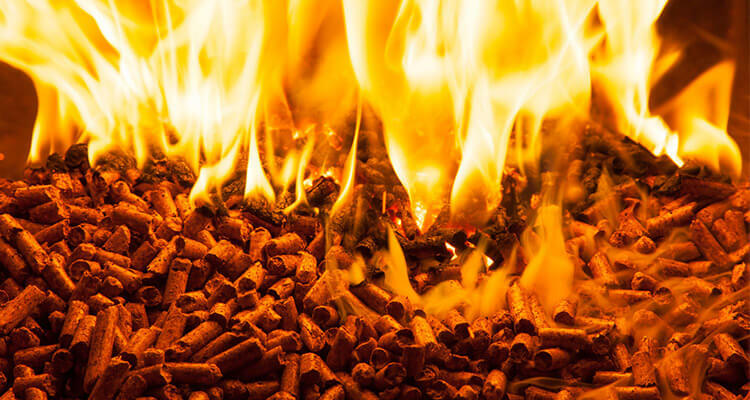 Wood pellets can be used for multiple combustion systems, and with the rapid development of wood pellets, there are many different types of pellet combustion systems came out, both industrial and residential. As we all know, if we want to ignite logs and branches, it is not an easy job. Wood pellet is much easier to ignite. Moreover, wood pellets have higher combustion efficiency, less smoke, and higher unit heat value than other wood materials. With all the above reasons, wood pellets are getting more and more popular, and more and more wood pellet plants have been established around the world, which makes wood pellet making machines a useful equipment worldwide.